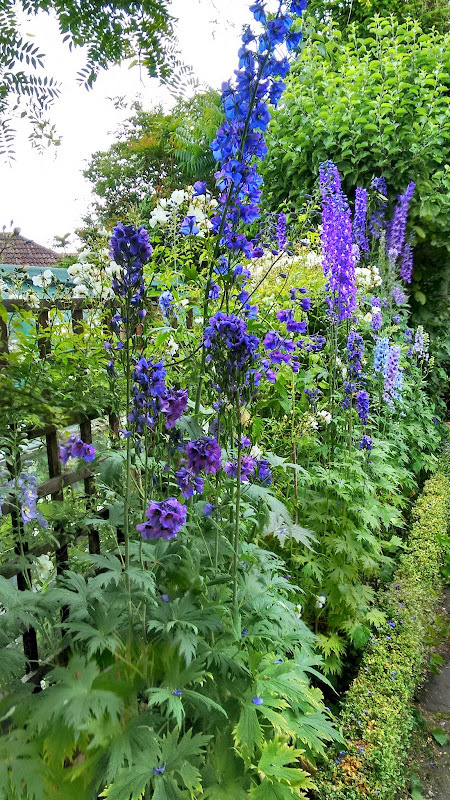 I adore Delphiniums years ago I had an allotment next to someone who grew Delphiniums for show - can you imagine an allotment of Delphiniums it was like being in heaven when they were in flower. 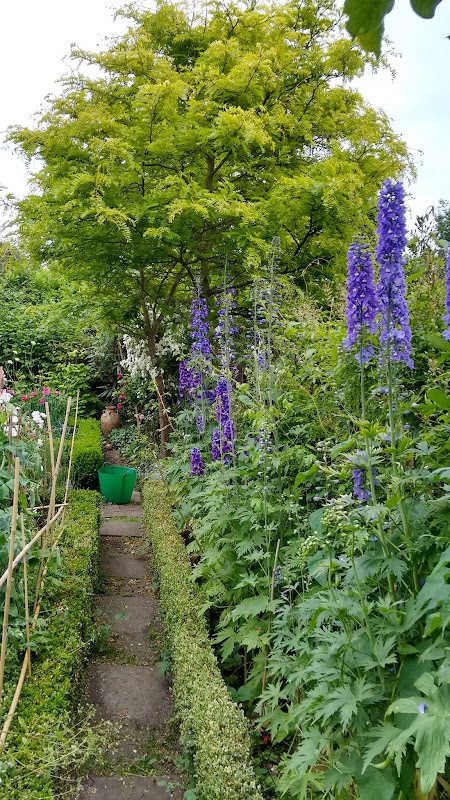 One thing I learnt was that it is very difficult to cater for the needs of a Delphinium in a mixed border because they need so much protection from slugs and snails. So I find by giving them a bed to themsleves is by far the easiest way to grow them and enjoy their beauty. All have been grown from seed why wouldn't you when it is so easy and such lovely colours develop. Sorry about the bindweed in my unkempt garden - I have since pulled it out but it will grow again in no time. An old cooking apple tree to one side. And to the other side a lovely Gleditsia one of a pair that arch over the path. Sophy's Rose under the front window such a joy to see from inside and in the garden. Sophy's Rose has a delightful fragrance. Jayne Austin by the front wall flowers profusely and frequently passers by stop to enjoy the scent. Pity the Internet doesn't have a scent button. Rather crushed by the Viburnum which needs pruning back although the Pink looks lovely against the purple of the Viburnum. Winchester Cathedral which hasn't been in many years and lacks light as it is near the Laburnum tree. Rambler Goldfinch on the fence just outside the back door. Veilchenblau Rambler such an unusual and interesting purple and white rose. In the foreground Carpenteria Californica shrub. This was a present and I seem to have lost the name. New Dawn climber a cutting from one in the front garden that may have been from David Austin roses. Sir Edward Elgar was a David Austin buy but is no longer on their website. Francine Austin grown up a tripod. Mayor of Casterbridge bought through David Austin roses but no longer in their catalogue but such a prolific rose in growth and flower. Charles de Mills from a sucker from my Dad's rose. Sweet Juliet grows strongly and flowers profusely. Crocus Rose which has the most delightful reddish stems in early seasons growth looking very attractive as are the lovely perfumed flowers. Rosa Mundi another sucker from my Dad's garden. Cottage Rose one of my favourites although it took some years to find the right position for it and a rooted section was passed along to my daughter and is also growing and flowering very well. A view up the garden with Cottage Rose in the foreground. The Box encloses the vegetable beds as well as providing a Box box at each end giving me an opportunity to grow a rose in each one 20 in total. Rambling Rector a prolific grower and flowerer which needs more room than the trellis I grow it on but nevertheless gives lots of enjoyment. Another view across the vegetable area although at this time of year it is more of a rose garden. Most of my roses are grown in this section of the garden. Amusing to think that gardeners used to try and persuade people to grow vegetables in their flower borders. I prefer to grow roses and other flowers in my vegetable beds. The borrowed landscape of the trees not only provides a good view and shelter from winds but also means our garden has a large number of birds and butterflies some of which are encouraged by the proximity of the copse. Aviateur Bleriot is a delightful Rambler. Another David Austin rose which is no longer on their list. Most of the 15 Ramblers in the garden and many of the 40+ shrub roses were bought through David Austin Roses, mostly over 30 years ago. Many of the Ramblers take very well from cuttings in late July, I put them in tall pots around the side and overwinter in a cold frame or the green house. Some of these cuttings I have shared with family and friends but several have been added to my own garden. It's surprising what grows from a cutting, provided you don't mind losing some and by then the disappointment of losing them is less, as there are other things to get excited about. As you can see I have a lot to thank David Austin roses for and love looking through their catalogue and making a beeline for their stand at any of the flower shows, but nothing can beat the joy of growing roses in your own garden and walking through them every day especially in June enjoying their delicious perfume. I think maybe only 4 don't have a perfume such a shame blogger can't share that smell. There is always room for just one more clematis they can be hidden in the hedge or fence and then when they flower what a wonderful sight. Above is Pink Fantasy. and even closer. It benefits by being in a bit of shade so that the sun doesn't bleach out the stripes. This is such a treat I bought this many years ago and managed to take a cutting before the original plant died. It has taken many years to develop but this year there have been several flowers. These are exposed to lots of sun and so the petals are bleached. I think it is William Kennett. Wadas Primrose a very early flowering large clematis. Mrs N Thompson a real delight especially in a dark corner. On the sunnier side of the arch is Clematis Rebecca performing very well. Nelly Moser from a cutting fills a space on the fence. Belle of Woking is quite a vigorous clematis. Niobe rather hidden this year but such a lovely deep colour. Somewhere to enjoy several of my clematis not just those behind the seat. Ville de Lyon which I thought I'd lost by accidentally pruning too hard, so a welcome treat to see it this year. Just some of the joys of June.